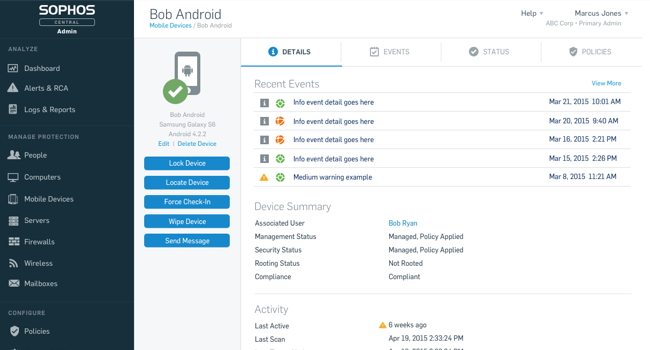 Sophos Central gives you one place to manage your endpoint, mobile, web, email, server, and wireless security. Using a synchronized security management platform, you’ll benefit from security intelligence sharing, policies that follow users, easy configuration, detailed and summary reporting, and automatically prioritized alerts. Simplify your life with a single pane-of-glass for all your security. Sophos Central is accessed via a web browser from your desktop or mobile. Built using adaptive design, the layout automatically optimizes for your screen size. We’ve optimized all the workflow routines, not only making them intuitive, but also streamlining the experience, keeping you on top of security wherever you are.